Nothing helped. I tried font reinstall and reboot. I'm still not sure what scenario lead to this situation. After release of P3DV4 the numbers were fine. Thanks for sharing indeed!. I have seen this issue now a few times without ever finding a good solution. Win10 does have issues with fonts for sure. Believe it or not, after night the issue is back. Tried the same trick but it didn't help. So basically you need to install the font after each reboot....? The font stays installed after reboot. But the procedure from initial post doesn't help anymore. I simply have no idea what could cause this. We are so far unable to recreate it on any of our systems and I got no idea how to debug this, no logfiles or anything are made for these things. I have found steps how to make the font work again but only till next reboot. :-) Tried several times. Just FYI I have windows creators update installed. Start prepard3 several times. The font is working. Start prepard3 several times. Panels are black. NO font. It doesn't matter if I'm switching from Eng to Cze or vice versa. The result is always the same. Okay is there anybody using english locale that has this issue? Look at the answer and verify that you got that update installed, it might not help at all but I will look at it when I get home. I fixed mine by rebuilding the font cache, using the attached .bat file. Check if the font in your P3d/ font folder are installed in windows/Font, if not, install them; then Launch the .bat file as administrator and reboot. I am using Win10 64 Bits. No other provision should be made other than installing this update of Windows 10: windows10.0-kb4020102-x64_9d406340d67caa80a55bc056e50cf87a2e7647ce.msu. The windows update mentioned above would not run on my computer ("This update is not applicable to your computer"), but my computer did update itself earlier today and it seems the font issue in the Twotter is fixed, I hope, although it still will not recognise an ILS signal for some reason. Yes. I found this script here https://www.tenforums.com/tutorials/54452-rebuild-font-cache-windows-10-a.html and it's working now!! I think the key must be FNTCACHE.DAT because I did all steps manually but didn't know about FNTCACHE.DAT. Now the font works even after reboot. The windows update didn't work...this morning back to no fonts...woe. I will try the cache rebuild strategy. Really. After installing the latest Windows 10 update, the font no longer shows on my Twotter panel. 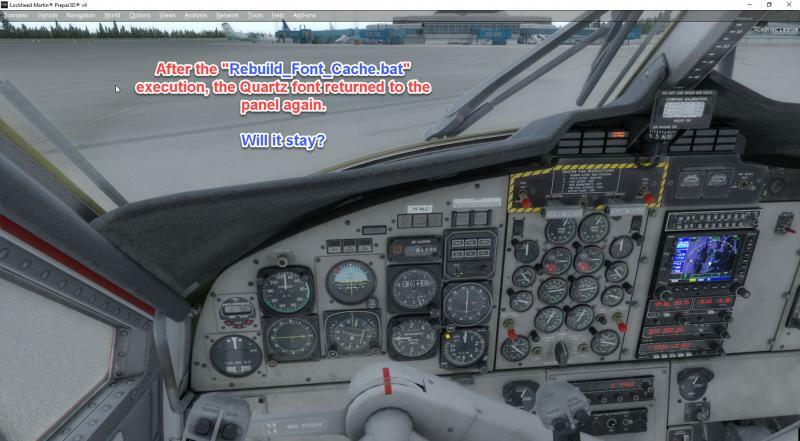 I then applied the "Rebuild_Font_Cache.bat" quoted by @fyrakoto (id # 11) with the Windows reboot and the font returned. Let's see if it (the font) remains. I have this issue as well. Have tried everything in this thread and am working through a "ticket" with Aerosoft. No solution forthcoming. P3Dv4 and Windows 10 pro. It really is a Windows issue, we have just no control over it further then the advise offered here in the forum. The strangest thing, something we simply do not understand, is why this happens only with about 5% of users. Yet, out of all the aircraft on my system (P3Dv4, Windows 10 - latest updates), it is only this one aircraft that has the issue. I had it working for a while yesterday using the re-install font and then reboot method. This morning - back to not working. But how could it be a problem of the aircraft, if after installing the font again it worked, you haven't changed anything at the aircraft last night and now it's not working again? 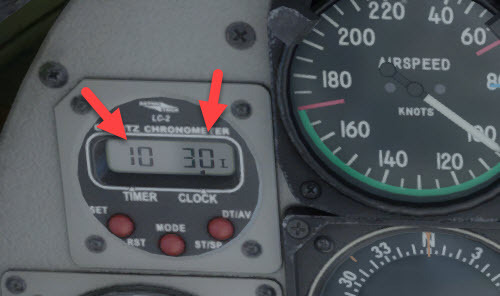 I have no idea what other aircraft might use or not use the quartz.ttf font, so the fact that you only see this problem with the Twotter is not an argument. If you read through the related topics here getting Windows 10 completely up to date and re-installing the font fixed the problem for them for good. So this still must be something in your Windows, that causes the problem. I just opted out of insider, rolled back and am a happy camper with not having to install Quartz.ttf and reboot to get the Navaids/radios and clock working again. Thanks for make this clear again. And therefore I will close this topic and mark as solved.